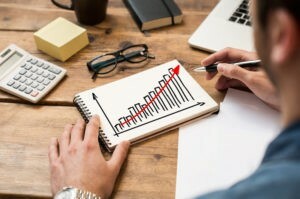 Small Business Investment Returns Astronomical? You are here: Home / management / Small Business Investment Returns Astronomical? In this week’s blog post, we’re going to talk about small business investment returns. But if you read no further, please please take away this crucial point: If you own a small business, you probably have no better class of investment opportunities than those offered by your small business. I know. That sounds unbelievable. But keep reading. Let’s say you’ve got a small business venture that you could sell today for $100,000. Good thing number 1: Your annual profits will grow from $50,000 to $60,000. So an extra $10,000 a year. Good thing number 2: Your business value will grow from $100,000 to $150,000 over the next five years. So in five years, you’ll be able to sell for $50,000 more than you can sell for today. These sorts of improvements in a small business probably aren’t that difficult to achieve. One or two clever decisions. A little more focus. And then that cash investment. But you know how it all works, right? But here’s what we (both you and I) often miss when we look at these sorts of investments. The actual small business investment returns we’re enjoying are really nothing short of remarkable. You have, I have, no better pond to fish in. With a simple situation like that just described, you can use a single Microsoft Excel formula to do the math and prove this point. But you want to think about the opportunity you’re considering as if it’s an investment in a specific way. First off, you want to consider that $40,000 you’ll need to fork over at the start of the process as the investment you’ll make. Second, you want to consider the return you’ll enjoy as a combination of the extra $10,000 a year in profits that you receive for five years… and then also the $50,000 bump in value you can enjoy in year 5. The table that follows summarizes the situation. And just to clear up one minor confusion: Year five’s cash flow includes both the $10,000 operating profit and then the $50,000 extra liquidation profit. The big question implicit in the table of cash flows above is this: Should you make that $40,000 investment to get the returns outlined in the table above? And here’s the answer: Heck yeah. The annual return on investment in this scenario is nearly 28%. Annually. Over five years. That’s outstanding. In any case, earning this sort of sustained annual return over several years puts you into the same class as the best venture capitalists, hedge fund managers and private equity guys. Yeah, yeah, sure, the dollars are smaller in your small business. But the percentages are really just as good. And in a sense, the smaller dollars work great for an entrepreneur. The preceding example calculation works when the annual cash flows are equal. But let’s make things a little more realistic. Let’s say the cash flows bump around a bit, which means you can’t use the Excel =RATE() formula. In this more typical case, you need to construct a little Excel worksheet and use the Excel =IRR() formula to calculate your small business investment returns. For example, say that the hypothetical investment discussed here still requires a $40,000 upfront investment and still pays out a back end $50,000 windfall. But say the annual cash flows start low and then rise over time: $6,000 in year one, $8,000 in year 2, $10,000 in year 3, $12,000 in year 4 and then $14,000 in year 5. The table below summarizes this slightly more realistic situation. Note that the $40,000 investment amount needs to be a negative value. And note that the last row labeled “Year 5” combines the $14,000 operating profit and the $50,000 back end bump in the business’s value. To calculate the return on investment when cash flows vary like that shown in the table above, you need to enter the values into an Excel worksheet range and then use the =IRR() function. The actual return on investment, by the way, equals nearly 25.76%… another outstanding small business return on investment. And, again, that return in fact resembles what you’d earn if you had invested in a top quartile hedge fund, venture capital fund or private equity fund. First, we small business owners need to keep our eyes peeled for potential investments we can make to grow our firms. Our small businesses should offer numerous great opportunities for high return investments. The investments will often look sort of, well, weird. They may not be the opportunities that look like traditional investments. But they will all work in a manner where you pay out cash today and then receive your cash back along with profit in the future. And you want to watch for these opportunities and try to frame them as investments that deliver specific rates of return. Note: I’ve said in other posts over the last few months that I think technology and training often offer great returns for small businesses. Peek back at those earlier posts for more grit on the details. Second, we small business owners need to plan ahead so we have the capital available to make great investments when they appear. Some of these investments are probably as good as you or I will ever get. No kidding, just last week I talked with a small business owner who had an opportunity to make a riskless investment where if he could come up with $50,000 in cash on Monday, he could get $60,000 cash back on Friday. (He needed a transaction to occur to harvest a specific tax benefit.) You can say that investment only shows a 20% return. But 20% in a week, well, that’s like 1000% a year. Fourth, you and I do still want to have a traditional retirement account where we accumulate additional savings. Even with the great returns offered by a small business, you don’t want to have all your eggs in that single basket. A valuable post.I never had any education on accounts,economy or business management but I was fortunate enough to start a small boutique hotel in Maldives. (Not to forget I received support from a Sri Lankan investment company at the very beginning as I didn’t have enough capital to start my business. )For a person like me this article gives knowledge and I believe this will provide support to achieve my goals.